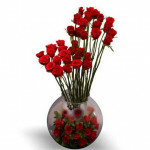 Send this warm and big hug of 50 red roses with your love to your special ones. Placed perfectly in a glass fish bowl will surely make a way straight to their heart for you. Send these flowers to your beloved to whom you want to express your love with a big, warm, sweet and huge hug from your heart's side.